Travel experiences of a lifetime. These are scanned pictures, because most of our major trips were taken years ago, before digital cameras, so you’ll have to forgive the lack of technical excellence. It is the trip that counts. 1. Gaping at exhibits at the New York World’s Fair in 1964. 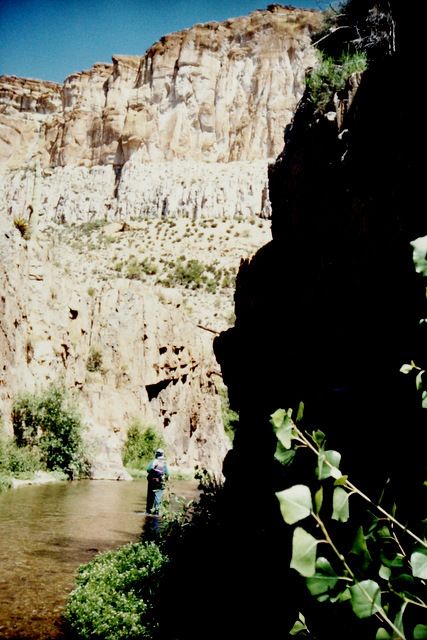 2.Hiking through Aravaipa Canyon in Arizona in 1989. 3. 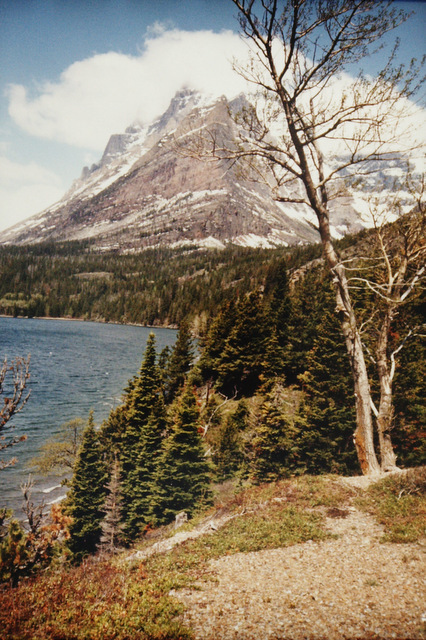 Hiking the trails and driving the roads of Glacier National Park in 1989. 4. 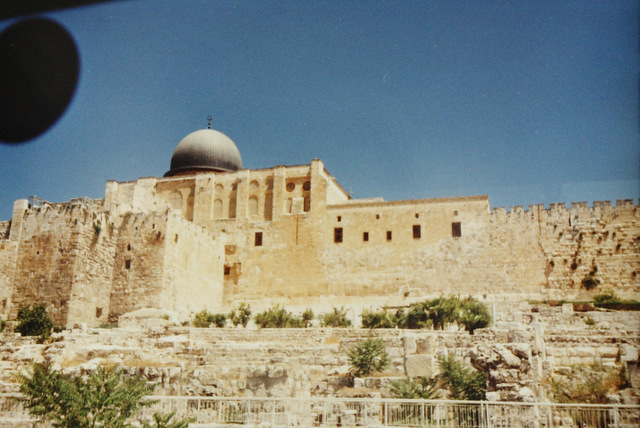 Seeing the sights and meeting the people of Israel in 1990. 5. 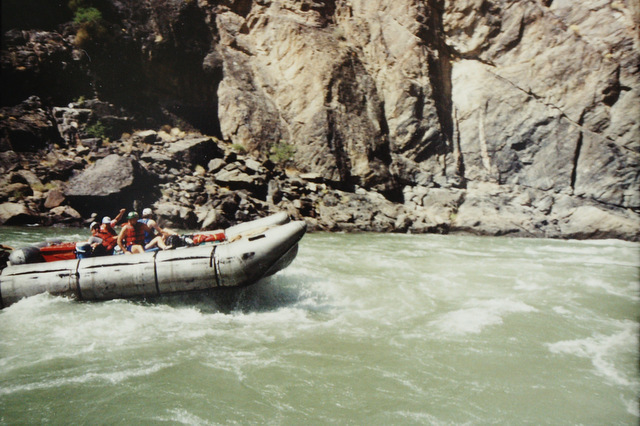 River rafting through the Grand Canyon on the Colorado River 1990. 6. Climbing the Steps of Angkor Wat and exploring other Cambodian Temples in 1999. We had many other striking adventures in the years between these. And of course the 21st century has brought more adventures. I think of seeing the Parthenon for the first time, sailing the Aegean, attending an Presidential nominating convention and an Inaugural Ball, visiting Taiwan, flying into Hong Kong, exploring New Zealand and many more, but the ones on this page make the top of our list for “once in a lifetime” experiences” because we only did them once, or because they were long-term goals that we finally realized. Each is unique in its own way. This is my contribution to Travel Photo Thursday, sponsored by Nancie McKinnon at Budget Traveler’s Sandbox. Click over there to see many more photos by travelers. What is YOUR once-in-a-lifetime experience? What great memories! Those steps at Angkor Wat have not changed! Still scary? I was creeping up them when I saw a pregnant woman literally running up the steps. Coming down, I wanted to just sit and bump like pooh bear down the stairs, but my guide held my hand all the way. Oh, I remember the World’s Fair! We lived so close, and went often. Such vivid memories of a very exciting event. Lucky you! We had to travel across the country. These are so great! You have been to so many amazing places! I know how lucky I am, Brette. Such a great idea to pause and think about your travel experiences of a lifetime! Love all the photos especially the globe from the New York World’s Fair. Somehow when I get grumpy because I’m not traveling as much this year, I have to remind myself of the fantastic, lifetime goals I’ve already met. Loved taking this trip with you! It is very fun remembering the trips we’ve taken. Your pictures brought a smile to my face even though these weren’t my memories. I was a few years behind you with rafting the Colorado River – 1992 I think. What a fabulous experience it was!! You have a lot of fabulous memories worth sharing. Love your photos, Vera. I agree, it’s not technical excellence that counts, it’s the trip and memories you’ll keep forever. A friend of mine never takes a camera on vacation. Shocked, I asked why. He said his mind is the best camera he has. 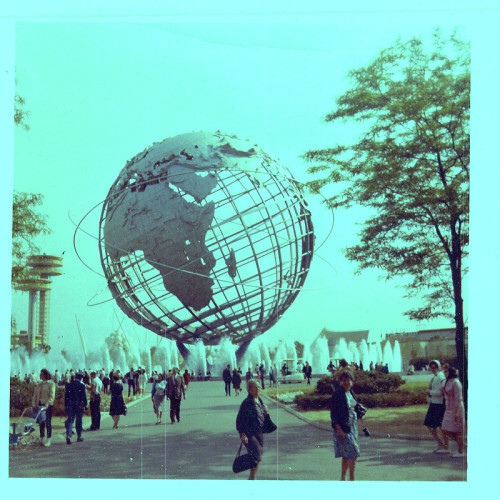 I get tingles each time I pass by that World’s Fair globe and I wasn’t even there. It’s definitely a magical, once-in-a-lifetime event. Thanks, Inside Journeys. Yes, we felt very fortunate to get to attend the New York World’s Fair, and even more so in retrospect when the phenomenon of World Fairs died out. Little did we know that we were at one of the last to draw nations from around the world! I agree, it’s the trip that counts – and the memories. Not the technical qualities of the photos. 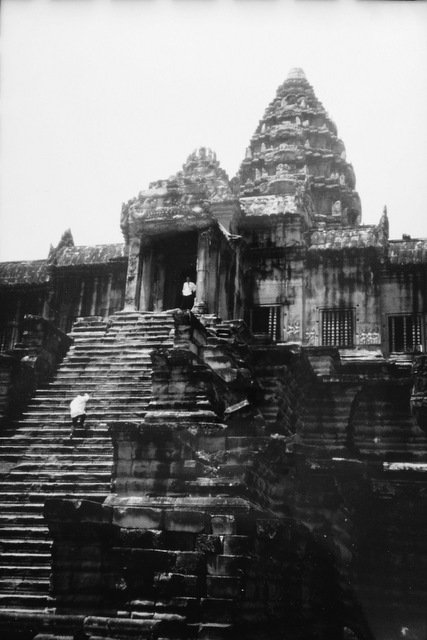 I like the black-and-white from Angkor Wat, looks like it was taken long before 1999, even. And the one from the World Fair in 1964 is very cool, too; like a scene from a Hitchcock film. Cary Grant could be walking down that street. Never thought of that, Sophie, but the World’s Fair would have made a great Hitchcock setting. And, of course, climbing the endless steps to the top of the Angkor Wat temple is a memory that will never fade, even when the photos do.